Beat Shazam is back for Season 3! 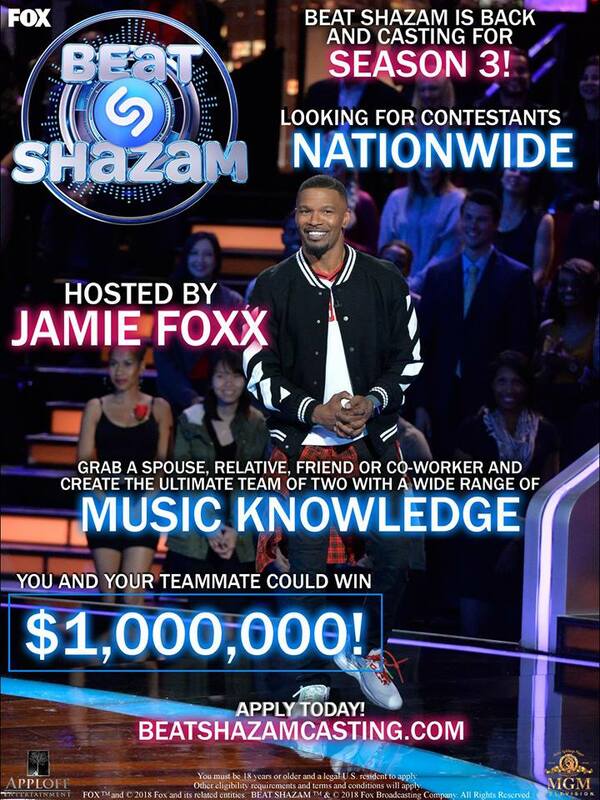 The game show, Beat Shazam, is now casting for it’s 3rd season and is currently taking submissions from contestants and their teammate who think they are up for the challenge and will take on that challenge to get a shot at winning the $1,000,000.00. As before, the game show is looking for teams. Casting directors seek big personalities who know their music. The nationally televised game challenges a team of 2 to name that song. Online auditions are going on now and folks interested in getting themselves and their teammate in on this, are able to fill out their information online. According to the show’s description – Beat Shazam is hosted by Jamie Foxx, “Beat Shazam” is an interactive game show that pits teams of two against the clock and each other as they attempt to identify the biggest hit songs of all time. In the end, the team with the most money banked will go against Shazam, the popular song identification app, for the chance to win up to $1 million. Actress, model and writer Corinne Foxx, daughter of Jamie Foxx, joins “Beat Shazam” as the deejay. 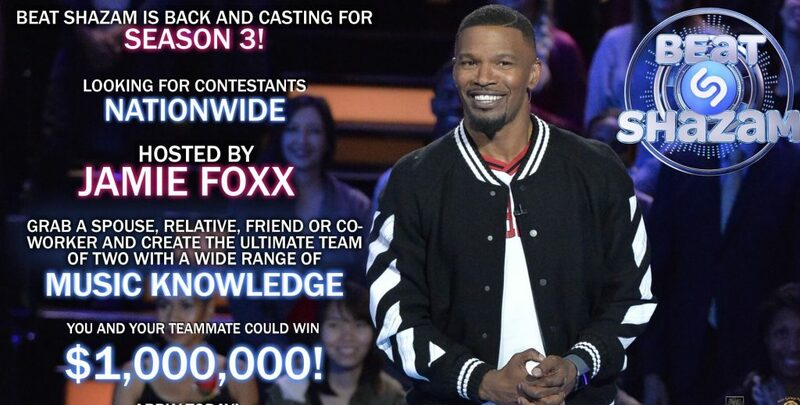 The challenge is music knowledge and casting teams for the show are looking for folks who with lots of it. Teams can be made up of any two people with a previous relationship. That can include a spouse, co-worker, neighbor, friend, sibling… or anyone you may know whose music knowledge may be as good as your own. BEAT SHAZAM normally features 3 teams who must battle each other and the time clock to figure out what the songs are. The show includes multiple rounds in a game show format. Teams vote on categories or genres and the one with the most votes plays. Correct answers translate to money added to the teams bank and the team with the most cash will get a chance to go against Shazam. Shazam is one of the world’s most popular apps, used by hundreds of millions of people globally to connect to the world around them. Building on its pioneering leadership in music identification, Shazam now helps people discover, interact with, and share video, audio, or printed content on TV, radio, movie screens, magazines, newspapers, packaged goods, and retail stores – and now Shazam lets music fans follow their favorite artists to see their Shazams and share in the thrill of discovery. The app has exceeded 20 billion total Shazams since its launch, and users Shazam over 20 million times each day. Hello! I was wondering how to apply to be on the show. I am a drummer and a music lover. I did not see any open castings or links to apply. Thank you! See the flyer posted on this page. Good morning!! My name is Vinnie. Most people know me by Ace. My life evolves around music. I get along with everyone. Many have told me I should be on your show so here I am looking to give it a whirl. Hey! My name is Candace and I am a 100% music LOVER. I most definitely want to be on this show. I have a huge personality, full of energy and Definitely love to have Fun and enjoy Life. I grew up listening to all Genres of music. So this is like the perfect opportunity to be involved in something that I Love!